Tonight (October 3rd), Lakeshore Baptist Church hosted a public safety debate for all of the Oakland November 2012 Candidates. Due to the timing and the format they were only able to ask two questions; the candidates position on gang injunctions/curfews and a general statement about their public safety platform. Blueford Police Report Released ..etc..
What is your response to restricting access, how Council is currently handling meetings and would you do things differently if elected in November? 2. The Alan Blueford family has had many complaints about the investigation of the shooting of their son. Their main issue is lack of access to information about the case and promises made to them in regards to getting help from the City Council. OPD Alan Blueford Police (redacted) Report ..scroll down to bottom of page. 3. A hired outside police monitor Robert Warshaw, has recently made public findings from a new report on the Oakland police department. This report concerns OPD’s legal mandate to make changes in their department as part of a lawsuit judgement. What is your response to this report? Does this change/affirm your opinion on Federal receivership of Oakland Police Department? 4. Despite police and fire consuming 67% of the general fund, public safety is a huge issue in Oakland. What’s your vision for and approach to funding a holistic, comprehensive public safety plan? How would this be reflected in general fund allocations? Please answer these questions in the comment section below. State your name (and if you are a staffer not the candidate please indicate that), office/district and your answer. I will share this post with anyone who is interested, please feel free to share with anyone and spread the word. Comments made on this blog post does not equal an endorsement.. Thank you for your service to the city through this blog and social media. If it is alright by you and your readers I will take these questions one at a time. The current restrictions are terrible. In this situation, locking the public out in response to public unrest over the failure of government to respond is exactly the wrong thing to do. If they do not violate the Ralph Brown Act, they certainly violate the spirit of them. We need an open government that is accessible and accountable to the people. Removing seats, clearing chambers, limiting access is the opposite direction to go in. 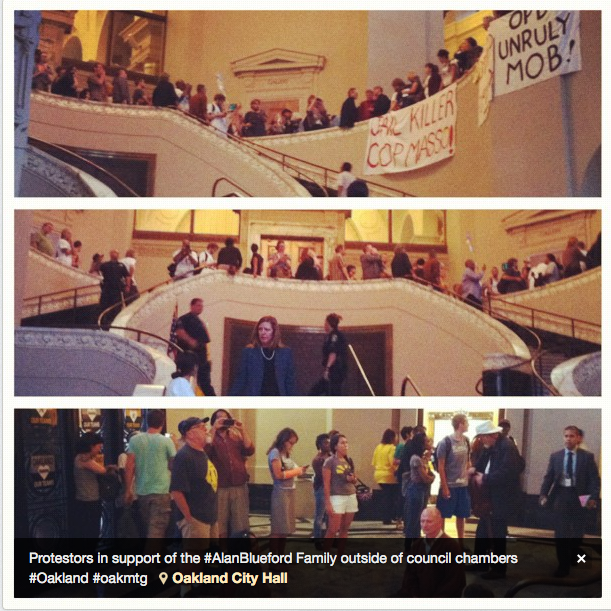 Doing Things Differently-Oakland needs to provide greater opportunities for dialogue in the first place. I have committed at my nearly 40 house parties and at candidate forums to a robust engagement of district3 if I have the honor of being elected. From 7 am coffee meetings on your way to work in Adams Point to evening meetings in out door venues in West Oakland, we will discuss the issues facing our city and gain strength from a diversity of view points. But it’s not enough to be open, we must be responsive at the difficult times to heal wounds and prevent further conflict. If I am elected, I will have a standing order with the police in my district that I should be contacted immediately at every officer involved shooting and homicide. The city needs a new approach to governance. Our city currently functions to keep the status quo lumbering along. It plagues our budgeting process, public safety service and starves our neighborhood’s of essential services. If elected, I could be one of three new council members who I hope will shift the philosophy of governance to a customer focused model. As Paulette Hogan, the great Oakland based HIV activist and public watchdog, used to say with some spirit, we need it where “Customer Service in Oakland is an attitude not a department!” That starts with the attitude of the Oakland City Council. I found last nights forum very limited and I wish the organizers of these things would do them differently. Your three questions are topical and important. Other important questions have to do with the police budget, staffing and their relationship with some of our other projects under Measure Y etc. And very important is to sort out what we can do now, quickly, and what we can do medium and long term. I am writing a short blog on that point and will post it as soon as someone checks my typos. Questions 2 and 3 fall under the category of police oversight. The quick answer is that I am in favor of a police commission with the power to dismiss and sanction police officers and officials for misconduct or non-compliances with policies and regulations. The long answer is I feel insulted and frustrated by the way the police have stonewalled the Blueford family, and the rest of us, when they should be open, transparent and dealing with the public’s need for accountability around the death of this youth at police hands. Police management should be available and willing to make sure that our officers conduct themselves honorably at all times. The foot dragging around the release of the police report in this case gives a different impression in my mind and in the mind of much of the public, including the family involved. A police commission should exist to make sure each case is dealt with by a reliable, outside authority. The lack of compliance with the federal court mandates falls along the same lines. There are lots of examples, many of which are in the court documents, going back through many more cases of individual misconduct and major cases of organization misconduct from Occupy on back. Yet nothing changes, and if we do not do something, we will find our police under federal court supervision. Why not just do as we should, get a police commission in place and make the changes that we all supposedly agree upon. There should be no impunity for misconduct in the Oakland Police or any other police. Now, back to your first question, about Santana and closing part of the public viewing space in City Hall. It is a step backwards. It avoids the question: “Why are our meetings always attended by protestors?” The whole point of the public involvement is to allow us to protest what we do not like. Taking away chairs shifts the discussion away from the outrage that happened. The problem is not that people protested. We were promised a police report and it is months late and we are given a bogus answers and false promises. The clear story is: A youth has been killed by the police and the police are months late to deliver a much censored report. And we are upset that the crowd was unruly? Seems like the least of our problems. It also feels like the actions of those waiting for an opportunity to shut out the criticism that they deserve. The problem at that meeting was not a loud audience, it was the lack of police accountability. The problem is a youth is dead and we do not know why. It will continue to be the problem if there are fewer chairs. Thank you for your questions. Although I have exhaustive thoughts on the state of public safety, I appreciate this forum and will address your specific questions below. I disagree with the move to restrict access to the meetings. I believe it sends the wrong signal. A fundamental right in our democracy is the right to petition the government to redress grievances. If elected I will move to preserve the right of assembly and free speech rights of our citizens. What is your response to how city council is handling this situation? Would you do something different? (You don’t have to comment on the Alan Blueford case, but to any situation where a family seeks the City Council’s assistance in regards to the police and access to information?). •	Make sure my staff is available to serve our constituents by helping navigate the bureaucracy to obtain timely information. 3. A hired outside police monitor Robert Warshaw, has recently made public findings from a new report on the Oakland police department. This report concerns OPD’s legal mandate to make changes in their department as part of a lawsuit judgment. I am deeply troubled by media reports on the issue of bringing OPD into compliance with the NSA. I am equally concerned about the future of the City should the Court order OPD into Federal receivership. There are numerous challenges within the Department. However one could argue that the Council has failed to provide consistent leadership throughout the time the Agreement has been in place. In a recent EBX story on the issue of receivership, Joaquin Palomino, examines why the Consent Decree was working in Detroit but not Oakland. One of his observations was the fact that Detroit had stable leadership to implement the necessary structural and cultural changes necessary. Unfortunately, Oakland has been beset with leadership challenges at every level. In the 10 years since the decree was established, we have had 4 or 5 Administrators, 3 mayors, and a host of police chiefs. The next council must work diligently to restore the public’s confidence in their ability to lead and provide oversight for the City’s affairs. No one knows the impact of Federal receivership but one can conclude that this move will harm the City’s ability to provide a sense of safety to its citizens and will be a deterrent for businesses seeking to locate or expand here. No matter what the Court decides, the next Council must be focused on meeting the terms of the NSA either to avoid the receivership or to fulfill its terms to restore local control. In either case, we can longer tolerate the status quo. I am running for Council because I believe that my skills, expertise, insight and maturity will help elevate the discourse of the Council to a place of respect for the People’s business and will help restore the public’s trust in our public institutions. I am committed to providing leadership in the area of government accountability, transparency and access because I know that many of Oakland’s challenges stem from the dysfunctional tone set by its elected leaders. Look forward to having our City Council meetings outside in the front where the sunken steps are and often used during our Mega Art & Soul Events. Oakland has a plethora of interested people who would like to attend and the front area makes this possibly. We should take advantage of our auspicious landscape and as a Realtor, I will as your Councilman. Following every City Council meeting will be food, beverages, and music as we celebrate the good times. We hope it’ll be worth the wait. Question 1: I feel that restricting access is not the correct approach to City Council meetings. As an elected City Councilmember, I would never support anything that violates the public’s ability to be present at those meetings. However, that being said, I do feel that the City Council needs to take a more powerful approach towards the facilitation of the City Council meetings. There must be an even-handed, consistent and clear approach. If members of the public aren’t respecting the rules for being present at a meeting, then they should be escorted out. While there may be difficult or controversial issues that get handled at a City Council meeting, I would always want the public present – that would be a priority for me. Question 2: As a City Councilmember, I would make sure that when a family seeks the City Council’s assistance with regards to the police, they must receive access to information in a timely manner. I feel that it is each City Councilmember’s responsibility to respond swiftly. I would make sure that the family members are heard and supported by a transparent system that provides answers. I would always stand for accountability in all aspects of service to my constituents, but particularly in cases where family members are in extreme pain and need answers. Question 3: I feel that establishing an Civilian Oakland Police Commission to oversee OPD would be a viable alternative to receivership. There most certainly would have to be an extremely careful consideration given to the complexities of the Commission, but, given the circumstances, it could be an alternative preferable to receivership. That being said, I do not feel that it is the City Council’s direct responsibility to adopt policies in providing direction to the city’s response to the NSA. As the next District 3 Councilmember, I will leverage my reputation and good relationships to push for compliance with the NSA. Question 4: It is imperative that we keep improving public safety and rebuilding the trust and cooperation between our community and the OPD. I have done this in my neighborhood, and I know it works. I did this without relying on a new tax or line in our City budget. I know we can do this City-wide. We don’t need to reinvent the wheel, but we do need to refocus on community policing strategies. I serve as Commissioner of the Community Policing Advisory Advisory Board, the Co-Chair of my local Neighborhood Crime Prevention Council (NCPC), and the Chair of the San Pablo Corridor Coalition, on of the most active community groups dedicated to improving public safety through progressive strategies. My work as member of these groups, as well as my years of community activism around public safety issues, have given me a broader perspective on the public safety crisis we face today. There is no question that for as long as the status quo is maintained, we will need more and more police. This is a vicious cycle; I believe there is a better way. We can create the positive change we need by using innovative, on the ground strategies and dealing with problems at the root. It doesn’t matter how many times we incarcerate, criminalize, or punish someone if we are not able to offer them a viable alternative to live a better life. In addition, as a City Councilmember, I will fight for funding to be allocated to support programs that will address the root of the issues and I will oppose measures that promote the cycle of brutality, dehumanization, and alienation that result from seeking quick fixes. I support Restorative Justice programs. I feel that the City’s involvement should go hand-in-hand with the programs to create increased opportunities for healing and advancement. Thank you so much for including me in this. We need to stop the habit of cutting back, restricting access, shutting down, and taking away civil liberties as a response to all issues. We need to stop retreating. If there is such rage at the city council meetings, then the City Council needs to step up and take more action, be more in touch with what is going on, before the issues are ever brought to a meeting. Violent mobbing has become popular. The City Council needs to take full responsibility in changing this dynamic by taking down the barriers, getting involved, doing just the opposite of running away out of fear. Speaking from the experience of opening my home to the neighborhood with multi-cultural programming, social services and the arts, I can say that a high level of accessibility to the public is a difficult way to exist, and it takes time to develop the ability to handle it, but to some extent, it’s where the City Council needs to go to tackle many of these issues. The Alan Blueford family was made to feel abandoned, deceived, and it volcanoed because others have been feeling the same way. They should not have had to seek City Council support, it should have been offered to them. It should be required that the Councilperson of the district become immediately involved with the family in support, if the death is perpetrated by a police officer or involves an act of the government, like, for example, a local soldier coming home from war in a body bag. This is especially true in the shadow of the Oscar Grant case. It should be a required protocol. We need to create a clarifying job description for the City Council members during the first few months of next year that holds us to a higher standard. We need to be firm in our boundaries, and our decorum. The City Council needs to set the example. We need to support the dignity of others in the meetings with our humanity, and not allow its disablement on the floor. We have a Citizen’s Police Review Board, for which I am in the application process. It’s hard to tell if there are spaces available on the Board, as their webpage, as well as much of the city’s website, doesn’t seem to have been updated since 2011. In any case, it’s hard to discern the Board’s effectiveness, as it is for much of City Hall, because of our lack of transparency and competency. This coming year will involve much organizing, structuring, appropriate hiring, and catching up inside City Hall. A federal receivership for the OPD is most welcome. My own experience in working on more communication and collaboration between service organizations around human trafficking and child prostitution, is that the OPD isn’t communicating with itself, while housing diverse perspectives and approaches. There are noble and brave officers working so hard to do their best, really trying to make a positive difference in the streets, but I was in Los Angeles for the 1992 Riots and all that led up to it, and know from experience that an untrusted police force is incredibly dangerous, and nefarious elements infect it like the flu. City Council needs to be personally involved with the police force. I will be all over it, like I will be with the OUSD; asking many questions, observing their training program visiting precincts regularly, talking to officers on suspension. We are the parenting unit for Oakland. It needs to be holistically approached, as every issue affects the others; we cannot have more revenue without more business, we cannot have more business without less violence, and we cannot have less violence without…more business? More cops? How do we deal with all of this in one fell swoop? The answer is, we cannot. Our problems are longstanding, and will take some time to resolve, taken in stages, taking into consideration our unique history to form our path. However, I do have some ideas. One idea I have is to utilize a task force I have been creating for the city, that will focus on strengthening the nonprofit organizations for the programs that have been experiencing cuts, such as the Friends of the OPD, the Friends of the Oakland Public Library. This way, we can have less drain on our budget, and more long-term, stable endowments of support coming to our city. Another idea is the re-establishment of business networking organizations to replace those that folded recently (and are still listed on the City’s website) as well as work with the currently viable ones such as the Oakland Chamber of Commerce, for the encouragement of the cross-pollination and support of for-profit and non-profit organizations. We need to develop the culture of philanthropy in our city that has dried up and shut down in fear, along with everything else. It’s not just about less drain, or redistribution of the general fund, but how we can create more contributions, more revenue. And all of this is about a holistic public safety plan. Santa Rita Jail 51% recidivism rate, and a large majority of ex-convicts live here, return here. Our re-entry programs have been drastically cut, many job opportunities, such as most provided by the huge development plan of the West Oakland Army Base, are not available to anyone with a prison record. If we want public safety, we need to stop the generational cycle of violence, rage and poverty in our underserved. Non-profit service organizations in this city are often started by those who have been through it, and want to help others get up to where they are, rise up with them. They offer work that helps their community, opens hearts, heals wounds. All of our public safety issues are related in some way to substance abuse. For a drug addict, working for a rehabilitation facility is one of the best jobs they can have to keep them on the straight and narrow; I have seen it time and again both with my own community development program I created for homeless shelters and rehabilitation facilities, the Phoenix Rising Homeless Project, and in the Substance Abuse Counseling program I attended at Merritt College. If we want to stop the cycle of violence, we need to offer inclusion, opportunity, acceptance, and do it with knowledge about the issues the underserved deal with on a daily basis. We need to stop thinking of them as ‘making up excuses’, see their reality, and invite them to participate in the world in a different way. And, they will be bringing in revenue by paying taxes and cutting back on the violence component. Third thing we need to do, is move away from institutionalized government programs and towards intimate community work with well-communicated networks of support. This again, can and will be done by nonprofit organizations, with strong Boards of Directors formed by local businesses that will fundraise and bring money into our city. Mayor Quan stated in the beginning of her term as mayor, that she wanted to “organize the neighborhoods”. I already have been taking that miles further. It isn’t just about organization, it’s about facilitating communication, bringing opportunity, enabling a culture of sharing. One of my developing programs at the Oak Tree Arts Center will provide multi-lingual interpreter services. Most families with children in my neighborhood do not have internet access or cars, and need help with day-to-day functioning. We need small organizations that connect hear-to-heart with the families, act as intermediaries for them with institutions, act as ‘cultural brokers’. Again, this doesn’t have to require much money at all for the city, if any, it just requires the facilitation of connections. Part of this effort of mine will be to involve organizations that specialize in non-profit development, like the Volunteer Center of the East Bay. They are a thriving force in San Francisco, not so much here. I am not looking for new ways to spend the budget, I am looking for ways we can cut back on our spending so that we can pay employee pensions. We have a huge deficit looming over us, and we have been too financially unstable for me to feel comfortable in relying on Oakland for our incredibly important programs. If I was going to submit a program, it would be a program that facilitated the networking and communication of the already existing programs. It’s not just the police force that is ignorant of itself, it’s all of these wonderful non-profits that are profoundly ignorant of each other too. We need to facilitate communication and collaboration among them for successful grant writing, the creation of innovative, effective programs, and the sharing of resources. These are the healers that are going to be invited into the homes. These are the one that can go deep. PS: I am completely against gang injunctions and curfews, in case you couldn’t tell. Is it the City Council that is mishandling the situation with this particular case, or the Police Department brass? Or both? I am a firm believer in access to public records and holding people in positions of power accountable for their actions. City Councilmembers, along with the Mayor, could be very helpful in helping the family obtain relevant information in a more timely manner. I was appalled, but not all that surprised when it came to the findings in the report. Sadly, the OPD has a long history of not being able or willing to deal with unexpected situations. While I would prefer to not go into Federal receivership, the ball is in the OPD’s court. I am emphasizing investing in effective anti-recidivism programs as the smart centerpiece to my comprehensive crime reduction strategy. Please read my policy paper http://www.dankalb.net/safer for details. Both general fund expenditures and Measure Y funding must be sources for funding these programs. Tonya, thanks for including me on this, and thanks for covering all of the candidate forums; you have become the most relentless and consistent twitter voice on the upcoming council election! Question 1. Deanna Santana has implemented rules restricting access to City Council meetings, by getting rid of some of the seats and forcing remaining participants to go to overflow rooms. What is your response to restricting access, how Council is currently handling meetings and would you do things differently if elected in November? Open meetings are a vital part of our democracy and those in charge of our City Council meetings need to be consistent, even-handed and competent in their application of existing rules to ensure speakers are heard and divergent views are respected. Oakland’s council meetings have become increasingly boisterous over the past two years, and I believe the fundamental issue is a the lack of unified leadership in the city, particularly around a public safety plan that is collaborative and transparent. As a councilmember, I will work everyday to rally our leaders and our community around a plan to do just that, starting with CeaseFire. If our city is going to move forward, we must reconcile the relationship between the Police Department and communities of color. This is why I’m a proponent of CeaseFire as a violence reduction strategy — it is data driven and collaborative, incorporating community as part of the long-term solution. Simultaneously, I will help our Police Department continue working toward a more transparent, results-oriented process, incorporating rigorous use of Compstat, which is used to great success in cities across the country. Question 3. A hired outside police monitor Robert Warshaw, has recently made public findings from a new report on the Oakland police department. This report concerns OPD’s legal mandate to make changes in their department as part of a lawsuit judgement. What is your response to this report? Does this change/affirm your opinion on Federal receivership of Oakland Police Department? Warshaw’s report has some troubling findings, and must be carefully weighed against the independent investigations completed by Alameda County, which cleared the officers involved. It is not my desire that OPD goes into federal receivership; this would have a devastating effect on city morale and set us back in terms of uniting around a public safety and economic development plan. Again, this city can’t move forward unless we reconcile the relationship between OPD and communities of color. It is essential that the community is part of the solution. Federal Receivership will only delay the hard work and leadership that we need to unite around a data-driven, collaborative, proven crime reduction plan. Question 4. Despite police and fire consuming 67% of the general fund, public safety is a huge issue in plan? How would this be reflected in general fund allocations? I support the full, comprehensive implementation of CeaseFire as described by David Kennedy in his book, Don’t Shoot. This strategy has helped reduce crime dramatically in cities across the country, including Boston, Cincinnati, part of Los Angeles, and Baltimore. CeaseFire relies on a public health model that does not necessarily require more police to implement; it focuses on the small number of people committing most of the crimes, and it leverages existing resources by establishing a more collaborative approach. It does this by creating a holistic, comprehensive outcomes-oriented relationship between families, community, clergy, job trainers, drug and alcohol treatment providers, police, probation, parole, district attorney and even the feds. This approach has been rigorously evaluated and shown to reduce crime. It is also often a means to healing the relationship between communities of color and police. Beyond this low-cost, immediate approach, we need to create career pathways for Black and Brown kids into the regional economy, and we need to build on the development models of Uptown and the Oakland Army Base, and bring developers, labor and community together to support an assertive development model that creates local hire, living wage jobs for Oakland residents. In addition, by adding housing units and catalyzing new retail, we will expand the property and sales tax bases, thereby growing the entire city budget.